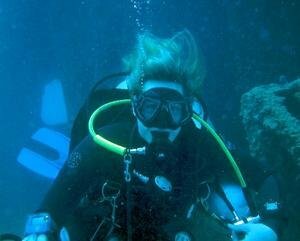 Rachel has been diving since 1998 and began working at Virginia Scuba their very first season in 2002. After working as a Divemaster that first year, she realized how much she enjoyed teaching other people about the amazing world of diving and soon after became an Instructor. Rachel was immediately intrigued by the technical realm of diving as a way to stay longer and see more! Her log book has visited many beautiful countries over the last 15 years, and 4 continents so far (more to come!). Some of her favorite dive spots for wrecks are North Carolina, Florida, and Canada. Rachel has now moved to Homestead, FL and is only teaching technical diving classes for Virginia Scuba. She is owner operator of Triton Abyss Diving there.